Some of those meet the basic definition of socialism. Military: publicly funded organization run by the government providing defense and other services. Police and fire: publicly funded organizations run by the (local) government providing personal and property security. US Post Office: publicly funded organization run by the government providing mail services. Medicare and Medicaid: publicly funded organizations run by the government providing health care funding. None of those groups are privately owned or purposefully run for profit. The Post Office would like to make a profit, or at least break even. The satisfaction of mocking those who in the name of silly labels, consistently vote against their own self interests. Thanks. Is it very satisfying? Sure, but it is not driven for profit by an owner or shareholders. Its primary role is to provide a service to the public which funds it. What is “taking it from someone who is hard working and successful”? That picture’s not telling the entire story. In addition to the golden eggs, there are also some very unsavory smelly droppings. I hate to break it people, particularly the cons here, but the U.S is NOT a capitalistic economy. It’s a MIXED economy. The U.S is a blend of capitalism and socialism in its conceptual belief. We have private businesses, public businesses, and government controlled businesses, and we have regulations making sure everything flows properly and protects civil rights. Nobody is advocating for socialism. The left/progressives are arguing that we should model ourselves after Denmark, Netherlands, Sweden, and Finland aka Democratic Socialist countries. They are not asking for full-blown socialism. They want tuition-free college for public universities, and everybody to be on medicad. Whether or not you agree with it (I don’t), is up for debate. But there has to be an honest discussion on it. Stop ruining it for them. 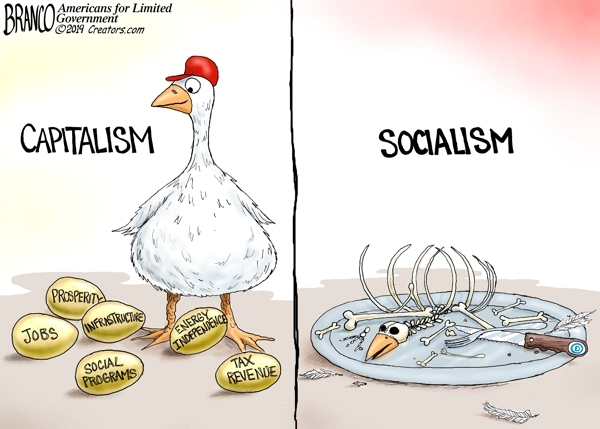 It’s soooo much easier to keep it simple: “socialism bad! !” This way you don’t have to think. Just like: “Mexicans are bad”. See how easy that is? It’s sooooo hard to think critically. It’s soooo hard to think through how some social policy that isn’t just flat out unilaterally for the benefit of the top 1% might actually make lives better for everyone. (But what about my freedom!!??). And since they don’t know how to do that, they’re really easy for the republican media/entertainment complex to steer. and we have regulations making sure everything flows properly and protects civil rights. Nobody is advocating for socialism. The first phrase is cute. The second sentence is not true. Also: highways. Libraries. National parks. Museums. Waterways. Public education. Public water fountains. Public toilets. Public prisons. No, they meet the definition of pooling resources. Stop! You’re confusing me! Socialism bad!!! Who is advocating for socialism? Everybody but me and you. Fair point. I have been a small government-deficits matter conservative for a long time. The Republicans pretend to be that. I’m not sure deficits do matter, but I ain’t smart. Numbers is hard. Huh? What on earth are you suggesting? Politically speaking, a fully informed citizen in today’s society is one who diligently gathers their news from MSNBC and Fox News, i.e., opposing points of view.